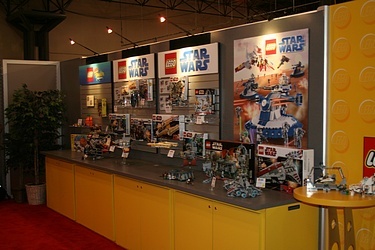 This year was an important milestone for Lego, in that it is their 10th anniversary of having produced Star Wars sets! Now a cornerstone of their lineup, they began releasing such excellent sets as the classic X-Wing in 1999 to coincide with the theatrical release of The Phantom Menace. They gave all of us who attended the tour a wonderful silver-chromed Darth Vader Lego figure to commemorate the anniversary and the event, and their Star Wars set for 2009 looks great as well! Click the image below for the full, uncut, 130 image gallery of their SW line, and see what's coming soon!